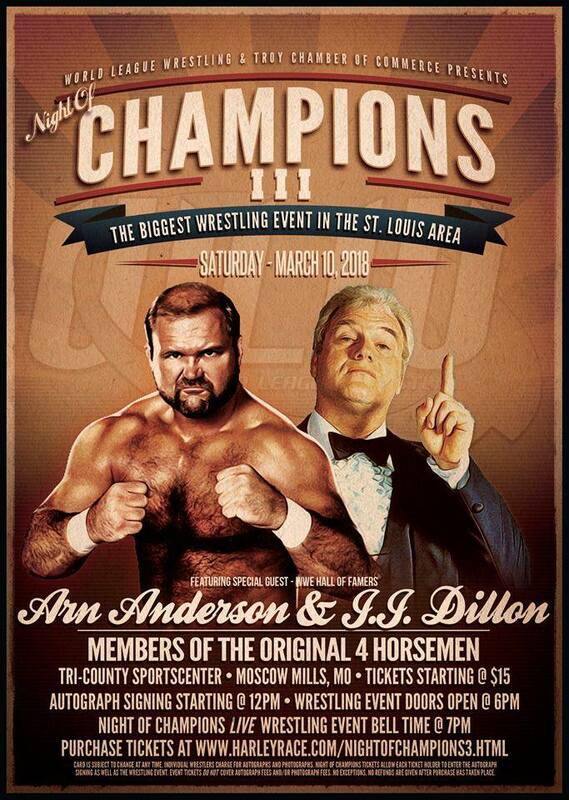 For the first time ever in the St. Louis area of professional wrestling, WWE Hall of Fame members and original members of The four horsemen.. JJ Dillon and The Enforcer Arn Anderson will be signing autographs together for Harley Race’s World League Wrestling! Saturday March 10th, 2018 WLW & Troy Chamber of Commerce Presents Night of Champions III – a mega event that brings together some of the best talent across the world in an effort to keep professional wrestling alive and strong. This autograph signing will feature “The Enforcer” Arn Anderson, JJ Dillon, Jimmy Hart, “Cowboy” Bob Orton, and “The Greatest Wrestler on God’s Green Earth – Harley Race. In addition to this autograph signing taking place from 12 – 3 PM, World League Wrestling will be hosting the annual live wrestling event – Night of Champions 3. All tickets can be purchased at http://www.harleyrace.com/nightofchampions3.html now. A very limited amount of Row 1 seats remain. Purchase yours now to ensure your attendance to the biggest wrestling event in St. Louis! The event will take place at the Tri-County Sports Center in Moscow Mills, MO just a few minutes from WLW’s home – the Race Wrestling Arena. This entry was posted on January 13, 2018 at 7:03 pm	and is filed under Uncategorized. You can follow any responses to this entry through the RSS 2.0 feed. You can leave a response, or trackback from your own site.